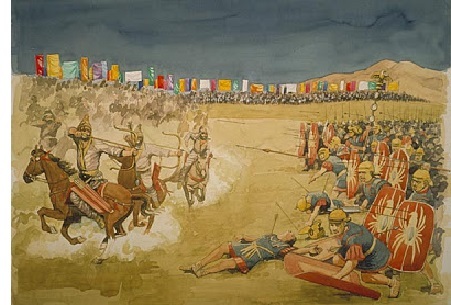 Battle of Carrhae (53 B.C.) - Marcus Lucinius Crassus was the richest man in the world in the 1st century B.C. ; yet it was Pompey and Caesar who got all the glory due to their military conquests. Crassus looked to change that by achieving a military success of his own. In 53 B.C., he decided to invade Parthia and score a spectacular victory over Rome's new rival. Unfortunately for him, he was better at making money than he was at winning battles. Like Caesar, who invaded Gaul, Crassus did the same in Parthia without receiving consent from the Senate. The campaign is recorded in detail by the historian Plutarch. Crassus arrived in Rome's eastern most province of Syria in 55 B.C. and set about using his tremendous wealth to raise an army. Within a year he had seven legions and about 4,000 cavalry. He then marched into Parthian territory. His son, Publius Crassus, who was considered a rising star in Roman society joined the expedition. Crassus decided to take the most direct route which happened to be through the desert. On the other side, the Parthian army was led by an able general named Surena. He had only about a quarter of the troops that Crassus had, but they were all mounted; about 9,000 horse archers and 1,000 cataphracts, which was a type of heavy cavalry. He used their location against the Romans by drawing them further into the desert. Near the town of Carrhae (in present-day southeastern Turkey), Surena stopped and prepared for battle. Crassus' general, Gaius Cassius (who would later become famous for conspiring with Brutus to assassinate Caesar), recommended deploying the army in traditional Roman line, with the infantry in the middle and cavalry on the flanks. But Crassus declined and ordered his men into a giant hollow square all facing outward, making it impossible to be outflanked. This was a defensive formation and depended on the enemy to come to it, which it never did. In truth, it turned out to be the perfect set-up for the Parthians to destroy the Roman army. He ordered his horse archers to circle the Romans from a distance and continually lob arrows at them. Crassus tried to send skirmishers out to attack, but they were always driven back by the constant volley of missiles. Crassus then tried to move his entire army toward the archers, but it was too cumbersome and the horses simply backed off before it could get close. Finally, Crassus decided to try to wait them out figuring they would eventually run out of arrows. With their tower shields (scuta) and heavy armor, his troops were well protected and most of the damage his men suffered were non-fatal injuries to the limbs. This strategy failed however, because what Crassus did not realize (initially) is that Surena had camel caravans supplying his troops with virtually an endless number of arrows. When it dawned on him that the Parthians were not going to exhaust their arrows, Crassus dispatched his son along with 1,300 Gallic cavalry to attack the horse archers. The Parthians retreated all the while inflicting damage on the Roman cavalry with their arrows in the process. They led the Romans right into the cataphracts, and while they had to deal with the Parthian heavy cavalry, the horse archers rode round behind the enemy and out-flanked them. The Romans, including Publius Crassus, were slaughtered. Meanwhile, Crassus ordered his infantry to advance as quickly as possible to try to aid his son. What he saw horrified him. The Parthian army returned and one of them carried his son's head on a spear. The horse archers resumed their attack and this time the cataphracts joined them. With the Roman army out of formation, the cataphracts assaulted them and inflicted heavy damage. They kept up the attack until nightfall, and when they finally backed off, Crassus ordered a retreat to Carrhae, leaving behind thousands of wounded soldiers. The next morning, Surena sent a messenger to Crassus offering to negotiate. Crassus was reluctant, but his men threatened to mutiny, so he relented. Surena proposed a truce and would allow the Romans to safely return to Syria in exchange for ceding all Roman territory east of the Euphrates. This would have resulted in a humiliating defeat for Crassus and he hesitated. Some confusion ensued and fighting broke out between the parties. Crassus and his officers (save at least Cassius who we know survived) were killed. Dio Cassius, the Roman historian, famously records that the Parthians poured molten gold down Crassus' throat to mock his notorious greed. Now leaderless, the remaining Roman army at Carrhae attempted to flee, but most were killed or captured. When it was all said and done, some 20,000 Romans were killed and another 10,000 captured. About 10,000 survived and made it safely back to Roman territory. 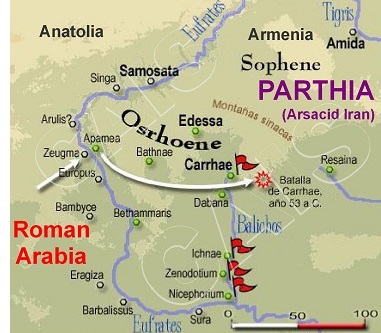 The Parthians lost a mere 100 men. It turned out to be one of the worst defeats in Rome's history. Despite this, it did not upset the balance of power between the two kingdoms in any significant way. Parthia was not nearly powerful enough to invade Rome. In a cruel twist of fate, Surena, who was more powerful than ever after his amazing victory, was killed by the Parthian king, Orodes II, because he feared his top general might try to usurp him. Back in Rome, news of the defeat came as such a shock, that the Roman government would be reluctant to launch any type of campaign into Parthia for years to come; however, Julius Caesar reportedly had plans to invade, but was assassinated before any attempt could be made.